As of September 30, 2015, it was confirmed that some five million Volkswagen-branded cars, 2.1 million Audi vehicles, 1.2 million Skoda automobiles and 700,000 Seat cars, as well as 1.8 million VW commercial vehicles were fitted with a defeat device in their engines, and were thus affected by the Volkswagen diesel deception scandal. Although VW claims that only a fraction of the defeat device-equipped cars will need a refit, the automotive manufacturer will likely have to recall 8.5 million diesel-engine vehicles in Europe alone. The carmaker issued a statement in November claiming that it received approval to fix about 90 percent of manipulated vehicles in Europe and around 70 percent of rigged engines in the U.S., entailing costs in excess of 10 billion euros. That said, it remains unclear if it is safe for the owners of affected vehicles to ignore the recall, if they will see a downgrade in their vehicles’ performance due to software adjustments - or if the vehicles will be fitted with a different engine version. Volkswagen's luxury brand Audi might have to put a halt to the production of its 2018 A6 model. The Volkswagen Group is a Germany-based carmaker. In 2017, the Volkswagen Group was the leading vehicle manufacturing company worldwide. In 2018, the car manufacturer sold around 10.9 million vehicles and generated about 235.8 billion euros in revenue. 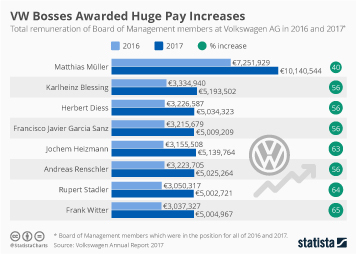 Although VW is the group’s most prolific marque, the automotive company has acquired several other brands over the last years, the most notable ones being Audi, Bentley, SEAT, Porsche and Škoda. In addition to its commercial vehicle segment, the automobile firm also holds large stakes in U.S.-based Navistar, as well as Scania and MAN, two European manufacturers of commercial vehicles and engines. After Volkswagen Group’s market share dipped to 10.52 percent in 2006, the company began to intensify its efforts in order to increase Volkswagen’s share of the global passenger car market, which stood at 13.55 percent in 2014. VW's shares plunged= after the carmaker was accused of nefariously falsifying emissions data. The company's attempt to mitigate repercussions resulting from the emissions scandal is expected to cost 30,000 jobs over the course of the next years. It is also rumored that the Volkswagen Group will spin off some noncore assets, such as its Ducati motorcycle brand.